Displaced Persons) and implementing different projects in areas affected by armed group. JEN now is doing projects in Mamilian IDPs Camp in Akre city, Sinjar district, Zummar sub district and Mosul city. Where the most vulnerable are. IDPs Camp. 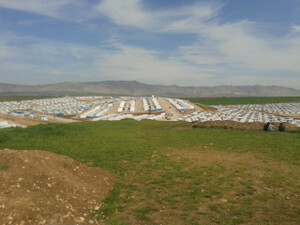 In the beginning, there were around 2,500 families living in the camp which were from different back ground. 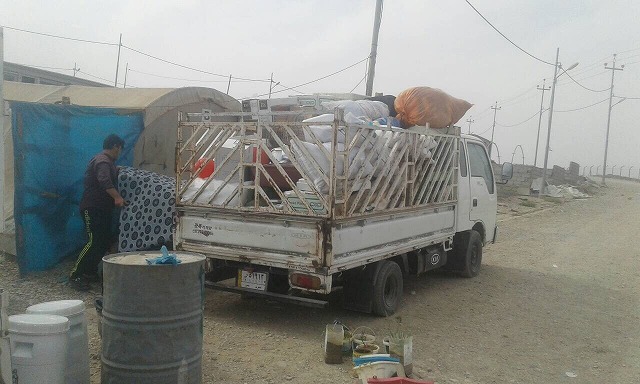 Since the armed group was defeated and the southern side of Sinjar city became safe in the past few months, some of those that heard through the local media that their home village is liberated returned home or to go to other camps. . Yet, some of them will still continue living in the camp. JEN will continue to support them by providing the best WASH services that we can. 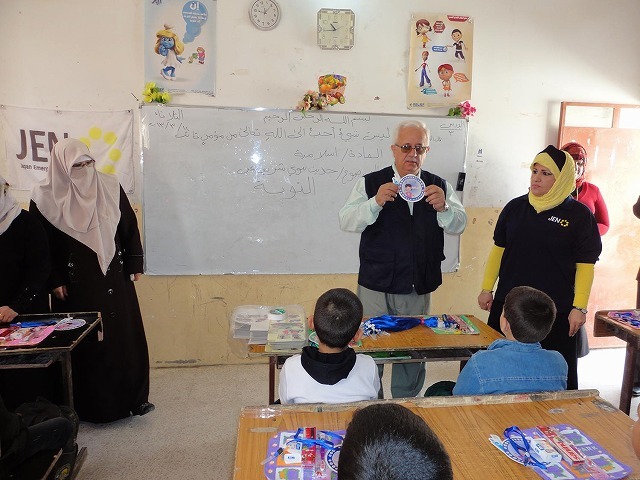 Our mission here is to help people be aware of the risk of diarrhea and the importance of hand washing and personal hygiene in maintaining health. 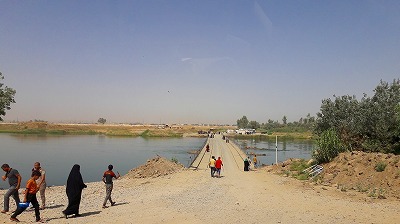 After Mosul was liberated, JEN started to provide water trucking in west Mosul. Every day JEN delivers almost 800,000 litters of safe water to almost 80,000 people. In late 2014, JEN was one of the first international NGO to support IDPs on Sinjar Mountain and the few people remaining in Sinjar City after the liberation. The area became safer day by day and the number of returnees are increasing in Sinjar City. 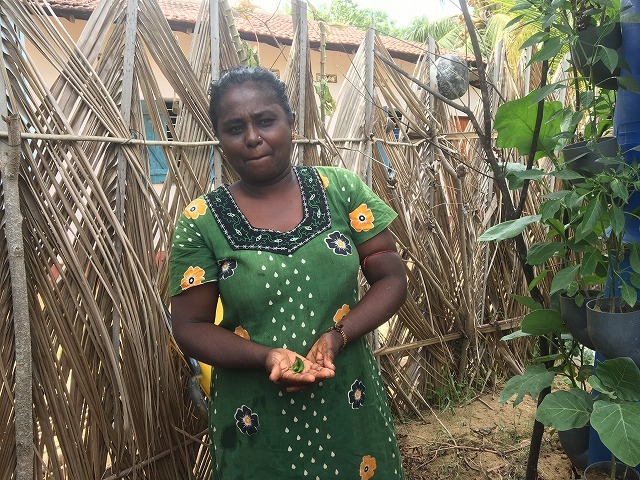 JEN supported their return by rehabilitating one of the main water facilities; and are happy to see that families are coming back and reconstructing their broken houses. 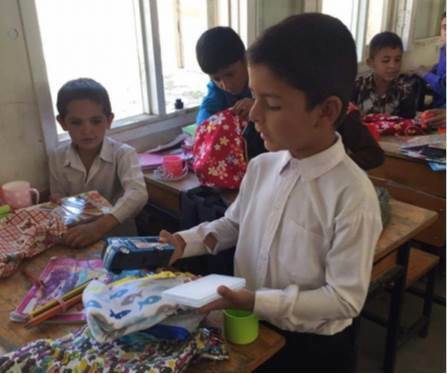 Next, JEN will work on school rehabilitation in Sinjar city so that the newly returned children have a school to study. 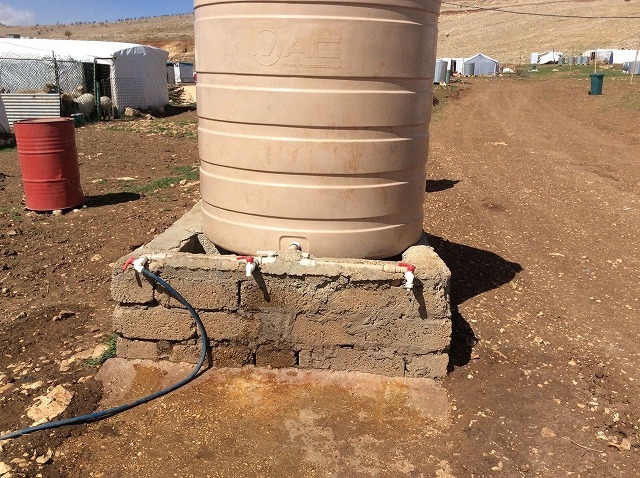 Water trucking is on going on Sinjar Mountain, JEN delivers water for displaced families there every day. In Zummar, 95% of families have already returned to their villages. The fighting there was brief but there was still a lot of damage to infrastructure, houses, water sources and pipes and the schools. People need these things to get their lives restarted and JEN delivers water by trucking in six villages of this area. The water source was destroyed by armed group and will take time to be repaired. The Local people are still waiting for the rehabilitation of the infrastructure. JEN will continue water trucking until mid of December and also working with water directorate to find other sustainable solutions for those villages. Blog by: Hozan Kamal Hussein and Sherwan Meerhaj Muhammed. 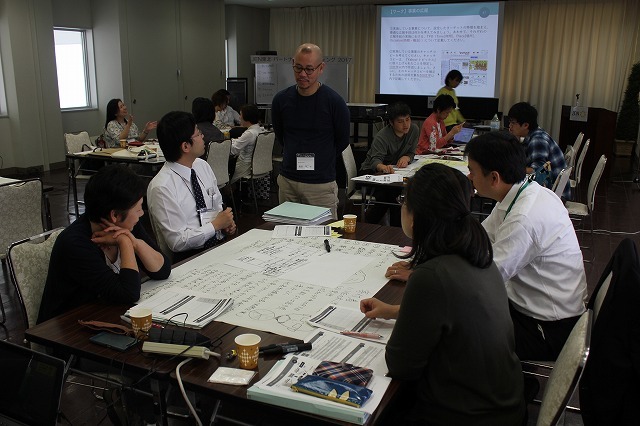 The “Tohoku Partner Meeting” was held at “Epoca” which is the accommodation providing the conference facility near the bullet train station called Kurikoma Kogen in Miyagi prefecture from October 3 to 4, 2017. 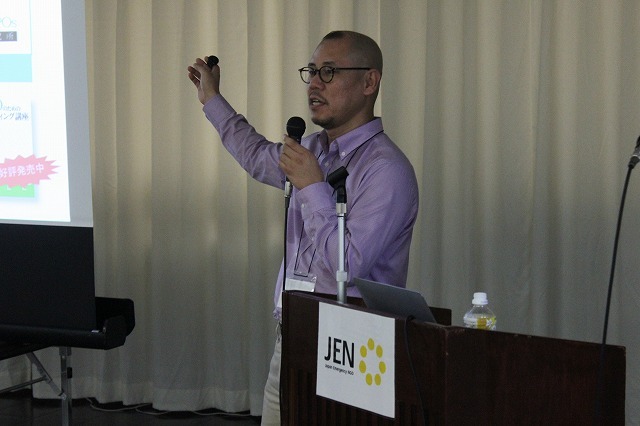 This is an annual event where seven organizations that partner JEN in its activities in the Tohoku area but usually work separately in different areas got together. Although each organization has its own theme of activities, there is one big common vision. That is “Restoration which leaves nobody behind”. On the first day, a relay talk was done to share information. 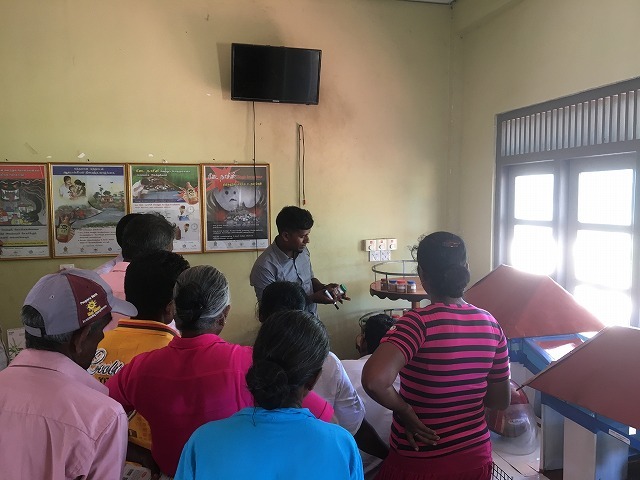 While they are a group of specialists, they get close to the local community and carry out activities to expand the relationship with the target groups. To establish a place mainly for single-parent families and “Kodomo Shokudo” as a place where regional cooperation occurs. To promote the involvement of people who are important to the future of the community to participate in community development. At the social gathering at night, various interactions such as promising to visit one another and planning joint projects have taken place. From the afternoon of the first day to the evening of the second day, a seminar on marketing was held by Mr. Yoji Nagahama, who is the representative director of PubliCo.inc, a think tank specializing in marketing for nonprofit organizations and whose mission is to establish organizations that can change society. The partnership with JEN is now at the turning point and each organization has to continue and develop its projects by itself about a year and a half later*. From the perspective of marketing, this event has become a great power for their next step, as it has enabled them to learn how to gain supporters and participants while enhancing the quality of their own projects by the lectures and practices. *Although the financial support to Ｉnclu Iwate has ended, JEN continues to support them in terms of their operations. 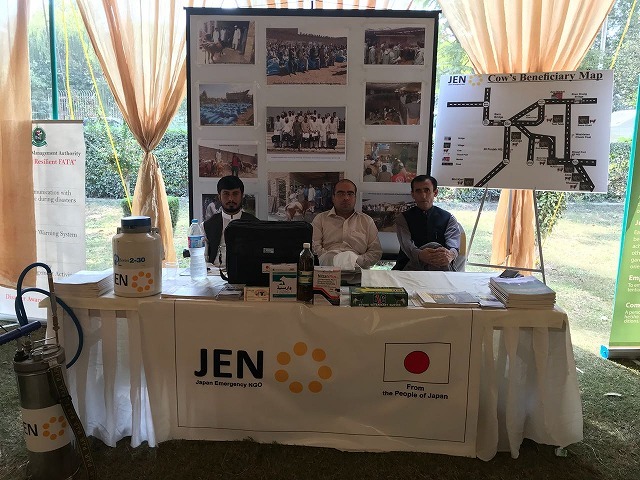 JEN is carrying out its activities in and around the capital Baghdad, which is under the jurisdiction of the Iraqi central government, and in the Kurdistan Autonomous Region in northern Iraq. In both areas, we provide assistance to those who have fled from attacks by armed groups and citizens living in the communities that accommodate them. ▼ For more information on our activities in Iraq, click here. Currently, tensions are increasing between the Iraqi central government and the Kurdish autonomous government. While minor conflicts are repeated between them after the Kurdish autonomous government carried out a referendum seeking independence, people from Kirkuk, whose number is said to be as many as 100,000, have started to temporarily evacuate for their safety in October. Refugees from Kirkuk are arriving at the camp in northern Iraq where JEN has been working since 2015. It has been nearly a month since restrictions on foreigners, including Japanese nationals, traveling to the Kurdish autonomous state has been imposed. ▼ For more information on the characteristics of the Kirkuk region, click here. ▼ For more information on our education assistance activities in Kirkuk, click here. ▼ For more information on our activities for IDPs and the refugee camp, click here. Currently, the border between Turkey and the northern Kurdish autonomous region is closed. We also cannot travel on land in Iraq for security reasons. The staff members dispatched from Japan have currently evacuated from Duhok, and are working remotely from neighboring Jordan. 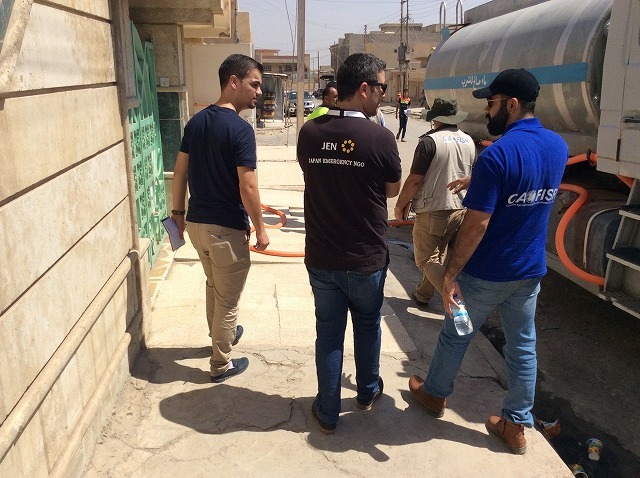 Giving the highest priority to their security, our local staff members in Iraq are smoothly carrying out their normal assistance activities. JEN will continue to provide necessary assistance to Iraq although its security situation is constantly changing and becoming more complex. We would most appreciate your support for our emergency assistance activities in Iraq. 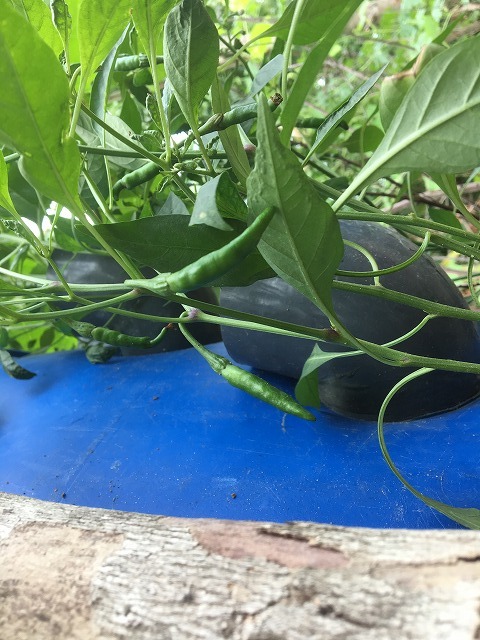 In this post, we’ll catch up with a family introduced in our previous report, who grow peppers with a hand-made irrigation. What is becoming of it since then? How big do they grow? Look! There’re many plump pepper hulls coming out! Madame Servamani told us that they’ve already enjoyed the harvests several times. When we visited, there were many plump hulls ready to be cropped. 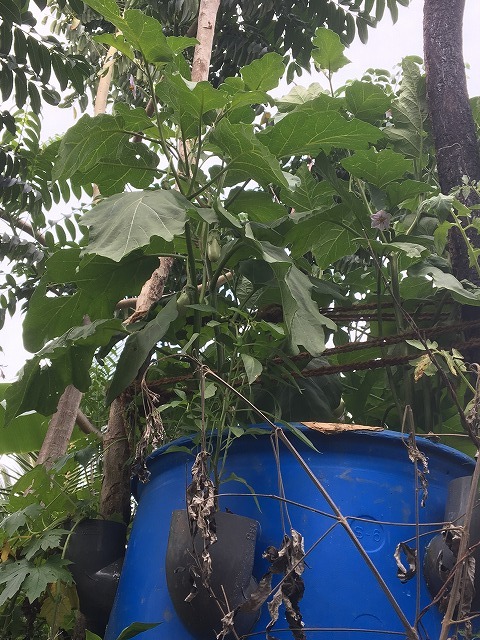 In addition to peppers, they are growing egg plants in the upper tier, which need a bit more time to ripe. We’re planning to compile 20 examples of water-saving agriculture into a booklet, which we wish may help the droughts-troubled district to improve the productivity by applying some of those ideas on their farms. In Iraq, school education began in 1921, and in the early 1970s education in public schools became free, allowing every child to receive school education. The Constitution established in 1970 stipulates that primary education is compulsory and all education, including university, is free, guaranteeing the right to receive education for everyone. In addition, a comprehensive campaign to improve literacy rate across the nation was initiated in 1978 for people between the ages of 15 and 45. As a result, the illiteracy rate has dropped from 48% in 1978 to 9.19% in 1987. According to a UNESCO report, Iraq’s education system had been the best among the neighboring countries until 1991, when the Gulf War broke out. However, the education system deteriorated after the Second Gulf War and the economic sanctions that lasted for 13 years became a burden, which not only worsened the quality of education, but also gradually lowered the literacy rate. School dropouts also increased due to the worsened economic condition of the people. the mop-up campaign against the armed groups. Look at the details here. FATA (Federally Administrated Tribal Area) Khyber Agency. This program focuses on breeding livestock. 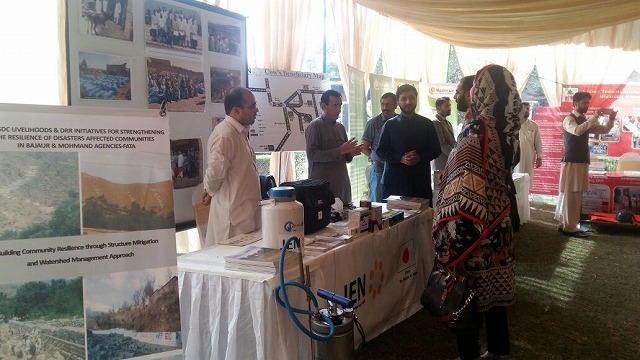 The government and NGOs jointly hosted an event on October 10 in Pakistan. The attendees looked back on aid given to North-West Pakistan and discussed about future support. Representatives from the government, academia, the United Nations, and NGOs made speeches, and discussed the importance of self-help efforts, cooperation, and resilience when disasters strike. 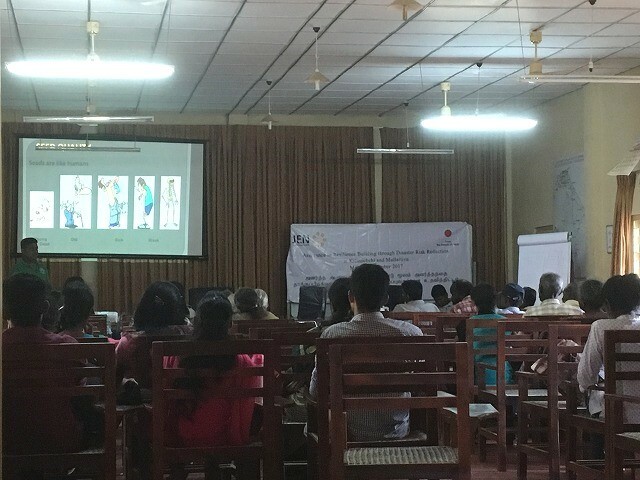 Also, 20 NGOs including JEN exhibited their activities. JEN displayed photos of its activities and some supplies and equipment used in its support activities. 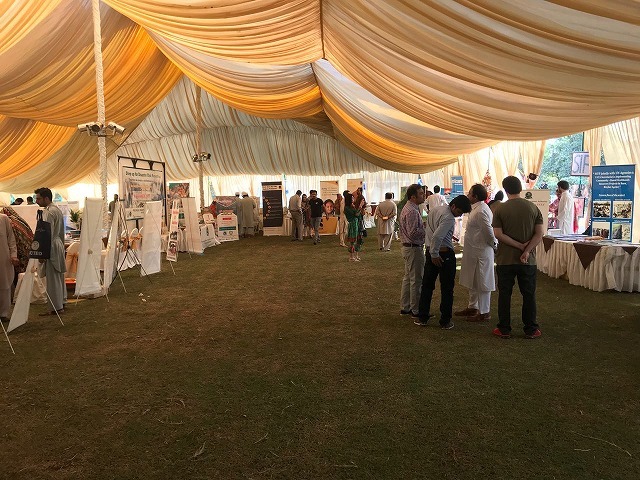 The attendees visited each NGO’s exhibition booth and asked about their activities. They were impressed after learning that JEN has been supporting people by helping them to generate income through dairy farming. Some attendees were students, and they asked us many questions. 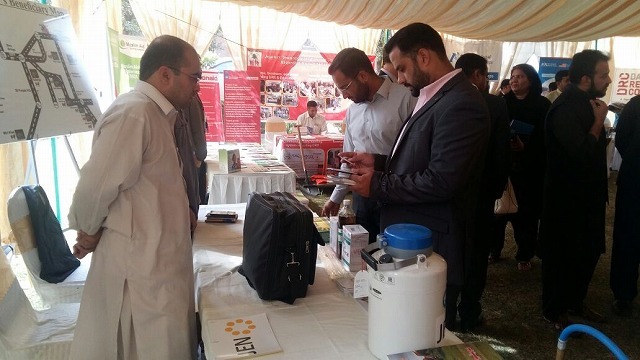 We explained some of our activities such as educational programs and technical transfer of livestock management. 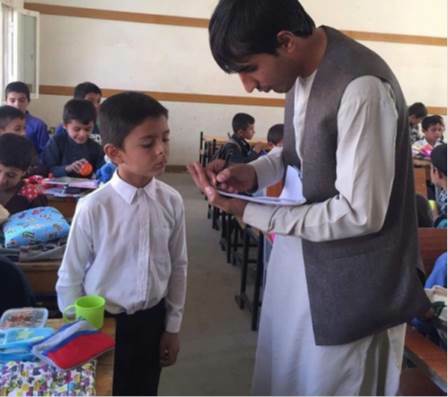 Harid is a 3rd grade student of elementary school, very eager and calm according to his teacher. He lives away from his father, who is a taxi driver in Kabul, the capital of Afghanistan. A week ago, he learned about Dream Bags project from his school teacher. Once getting his dream bag in his hand, he was so excited to find stationaries and more in it. He made a promise to himself to go to school every day. 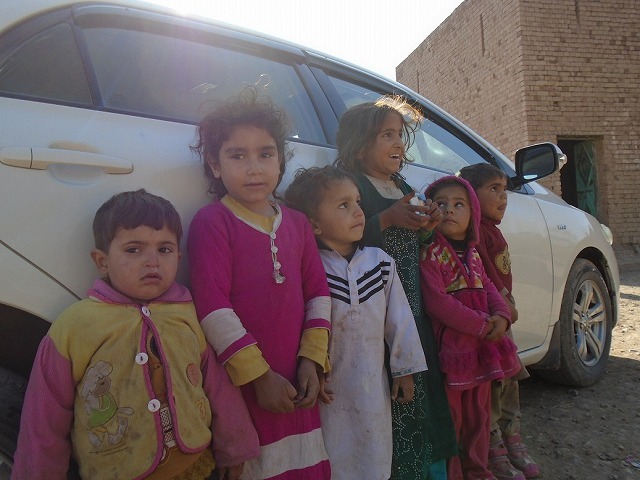 There many families in Afghanistan who cannot afford to buy their children the stationaries. Our Dream Bags project is to offer such children the joy of learning and the dream for the future. Children, who will lead the next generation, are the main victims wherever there are conflicts and battles. The situation is the same in FATA and many kinds of support programs are being carried out. However, there is more work to do for children. Not many children go to school. According to their parents, public schools are too far, while they cannot afford to let their children go to private schools. The parents work hard and spend the money they earned on clothing and medical services. They save what little money left against unforeseen expenses. We expect that the parents will spend money on their children’s education if they can earn a secure income through livestock with the help of JEN. 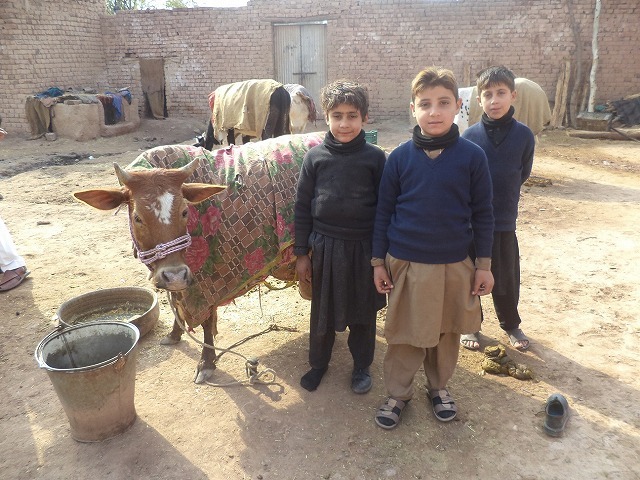 We often see children playing with livestock. They look happy, but their smiles should be seen not here but at schools. Support for children’s education is far from sufficient. It is smiles of more children at schools that will lead to the future. Situations of girls’ education can be said to have worsened. It is necessary for people to deepen their understanding of the importance of education. FATA’s situations will be improved only when various efforts like this succeed. JEN is raising contributions. Thank you in advance for your cooperation. Have you heard of seed banks? As the name suggests, it is a mechanism to lend seeds. As we have often been reporting, Sri Lanka is a country which is vulnerable to climate change. In particular, in the northern part of the country, plants do not grow due to droughts and crops cannot be harvested, nor can seeds for the next planting be harvested. 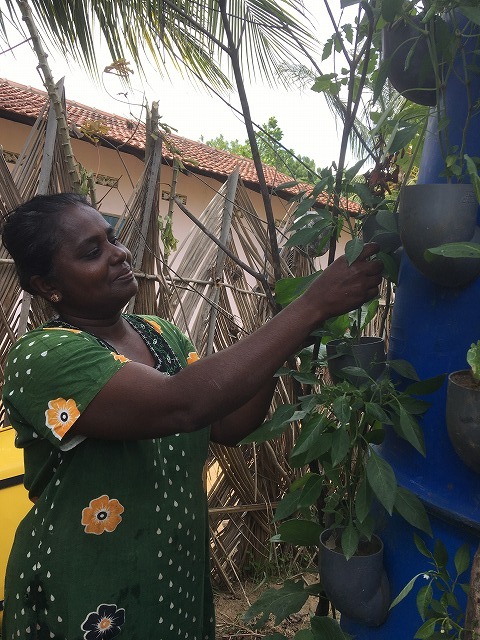 To improve this situation, JEN is considering establishing seed banks in cooperation with agricultural cooperatives in various parts of the country. In preparation, we are holding workshops on what seed banks are, how to collect and preserve appropriate seeds, what is necessary for the establishment and operation of seed banks, and when and how they will be available. Many households are preserving seeds on a private basis, and their preservation method varies. Preserving seeds at community level will allow more types of seeds to be properly stored in accordance with the characteristics of each area, and this will make it possible to lend seeds in emergency. Afghanistan often suffers from many natural disasters, so it’s crucial to educate the residents on how to prepare and respond to them. The most efficient solution is for the whole community to tackle on this issue. Unfortunately, it’s women who suffer the most at the natural disasters. Many of them haven’t been properly educated, not capable to teach their children and family how to prepare and handle the disaster. However, it’s also women who conventionally take care of family, so it means a lot to enlighten them on the disaster prevention and mitigation. That is how JEN held the first workshop for female residents. The participants were very eager to learn on the appropriate preparation and response to the earthquake, flood, and wild fire. “Most of us climb up to the roof on the earthquake, believing it the safest place. But I learned in this workshop that is wrong, and I will teach other women in turn. 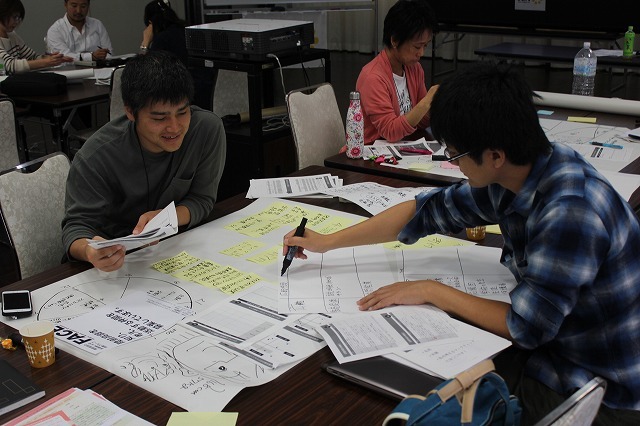 In this 3-day workshop, there were also the video sessions and group works. Another participant told us when her child got injured. “I’m so pleased that women, the victims of disasters, now finally can take a key part in the prevention and mitigation of them.” said the other participant. It’s highly expected that more women will play a significant role in their family and community. 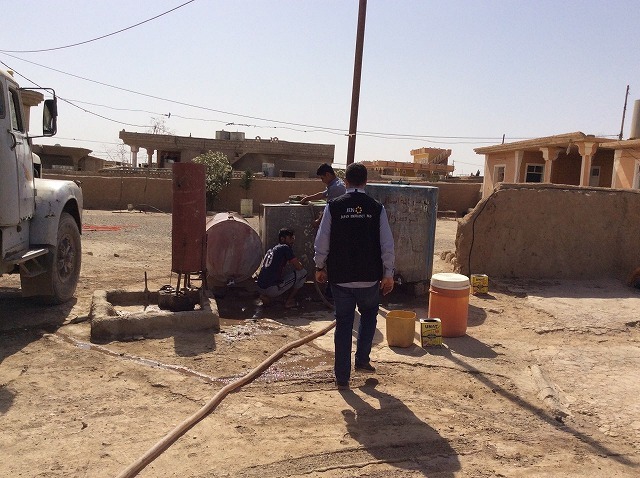 Water supply activity has started for returnees from October 1st in Ninewa, West Mosul. 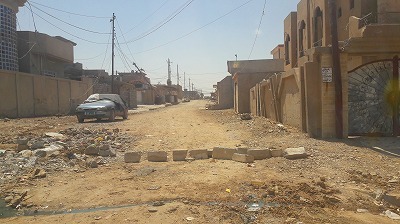 Ninewa was liberated from the armed group. After October 2016, Iraqi government began operation for liberation and finally Mosul was liberated from armed group on July 2017. 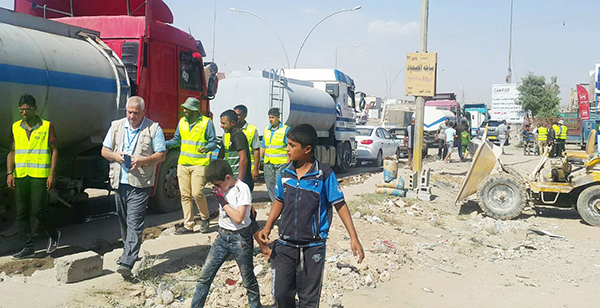 Now, returnees are rushing for Mosul in large numbers. 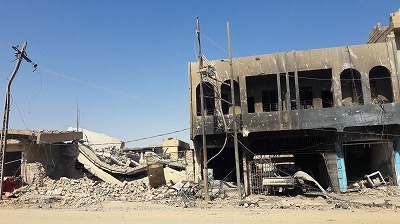 People who tried to return to the west side of Mosul, the destroyed bridge, buildings... JEN’s international staff filmed the miserable situation of the city. JEN will start emergency support activity on the west side of Mosul.